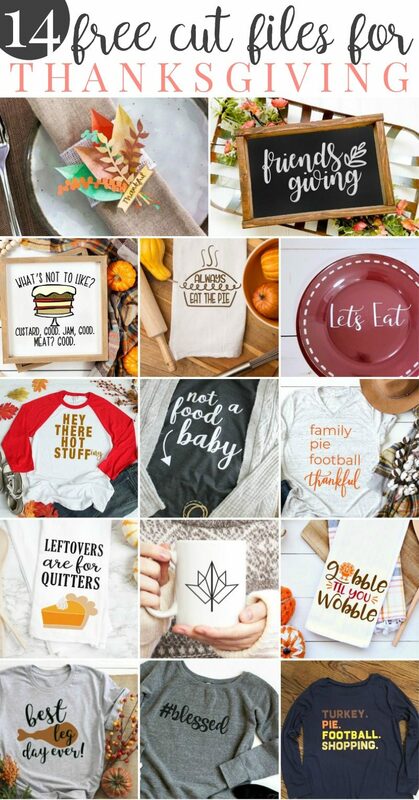 Pull out your Cricut or SIlhouette and celebrate Thanksgiving in style! 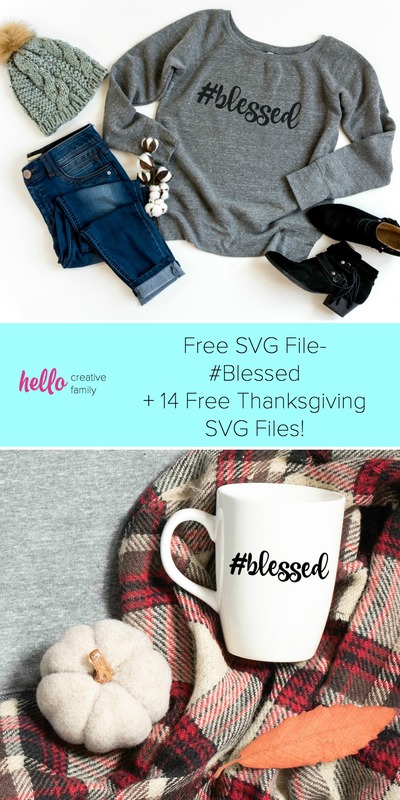 We are sharing 14 free SVG Files that are perfect for Thanksgiving including our own #Blessed file! Make an easy handmade gift or decorate for fall with a fun cutting machine project! 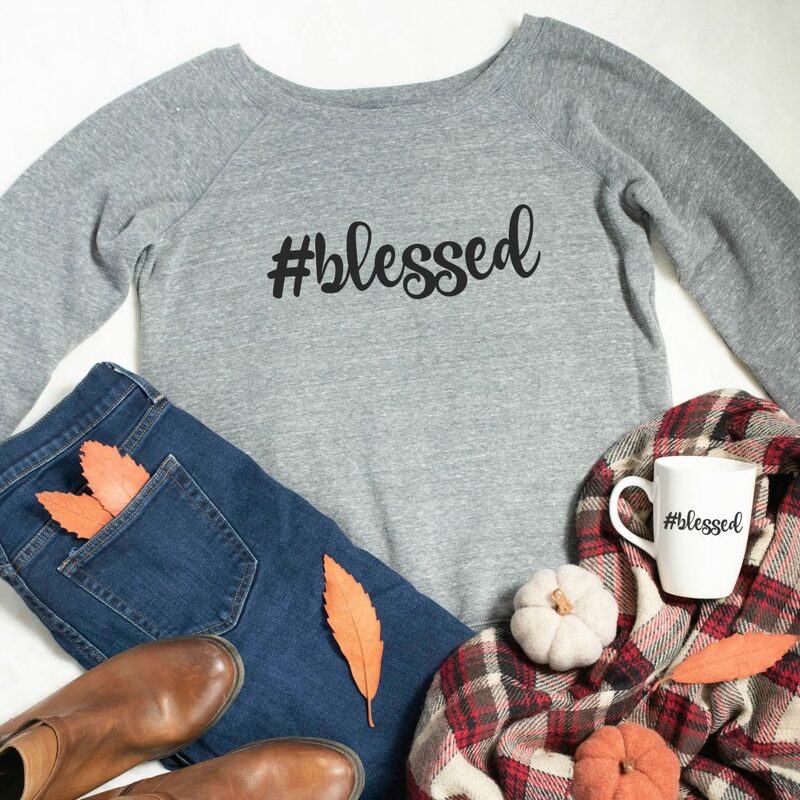 This past weekend was Thanksgiving in Canada and there is only one word that can be used to express how I was feeling on Thanksgiving (and quite honestly every day)– Blessed! I read a study a few years ago that said that a person’s happiness increases when they express gratitude. Pretty amazing right? I’m a big believer in counting your blessings and being grateful for what you have and the people in your life. My husband and I recently celebrated our 12th wedding anniversary and I made a “resolution” of sorts to him for our upcoming year of marriage. I told him that I was going to do a better job of expressing my gratitude to him and verbalizing to him how appreciative I am for all the amazing things that he does for me and our family. My husband has always been incredibly supportive of me and all of my crazy, creative dreams– Including my latest dream. I used to have an Etsy store where I created appliqued shirts for kids, once my blog got busy and I went back to work full time I made the decision to close my shop. 4 years ago I left my full time job to blog full time but my Etsy store remained closed. In the next month I will be re-opening my Etsy store and launching a brand new line of clothing with the goal to inspire creativity and kindness for families everywhere. UPDATE: We’ve reopened! Buy this shirt here. As a big thank you to you, for supporting me with all that I do, I am giving away a free SVG file for my #Blessed design! This design is for personal use only, but I sure hope that you and your family get a ton of use out of it and that it reminds you to count your blessings, celebrate the little things and encourages you to express gratitude. 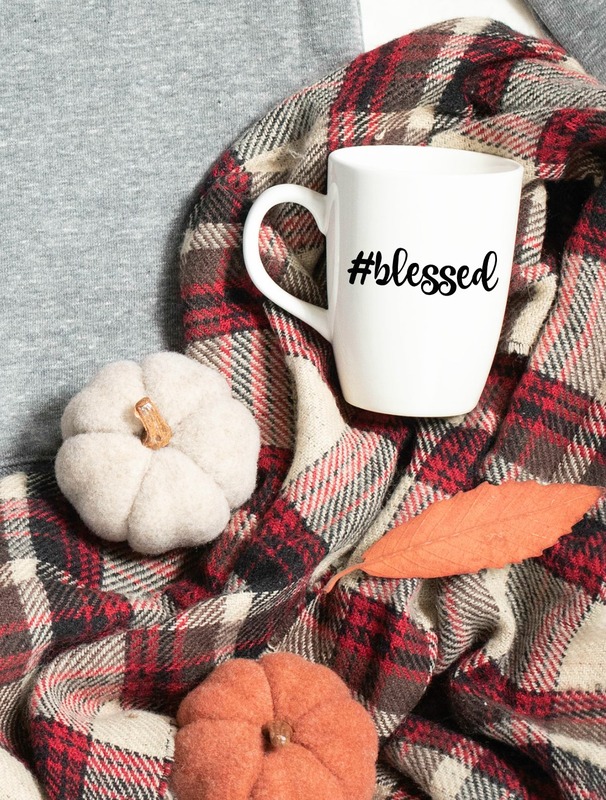 You can find my Free #Blessed SVG File here. On a tote bag, a makeup bag, your phone… or just about anywhere! I hope that you get a ton of enjoyment out of it. Another thing that I’m grateful for this Thanksgiving (and quite frankly every day) are my amazing blogger friends. Last month we brought you a bunch of free Halloween SVG files and this month we are joining together again to bring you 14 Thanksgiving themed free SVG files! 4. 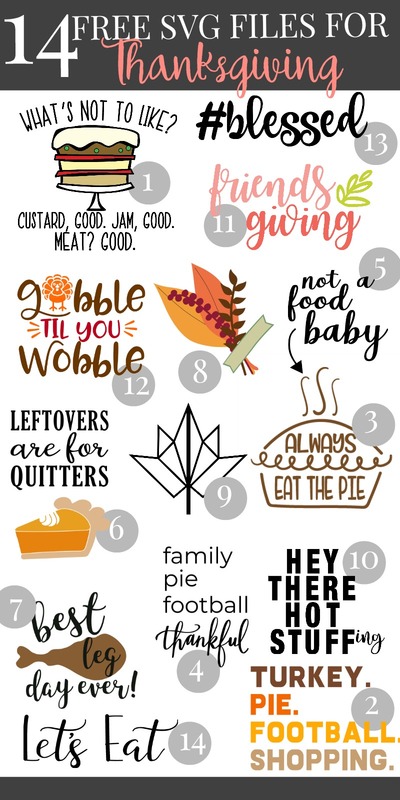 Family, Pie, Football, Thankful – Pineapple Paper Co.
Just look at all of the adorable things you can make with these SVG files! Make sure you swing by the blogs to download them all! Tell me… What are you grateful for? Do you believe that expressing gratitude increases happiness? 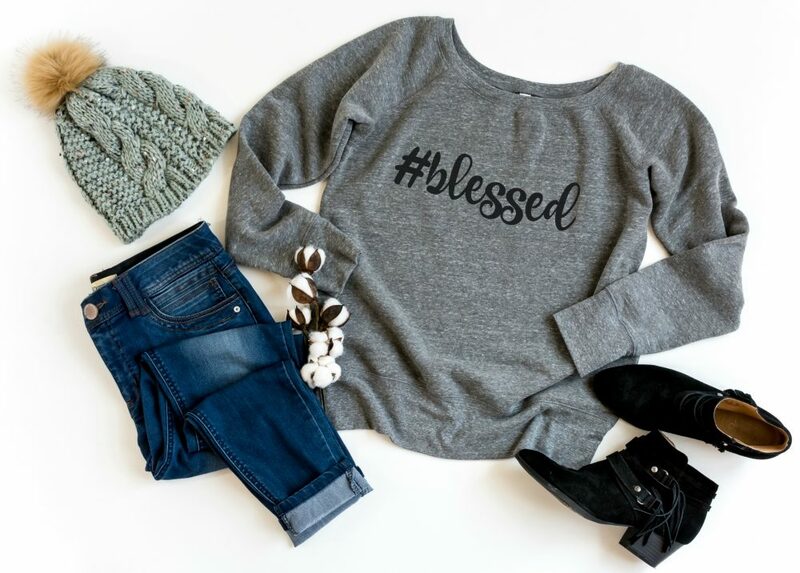 What would you put our #Blessed SVG on? Looking for more fun ideas to make with your Cricut? Find our Cricut category here or by clicking the photo below. Where are the “blogs” you refer to for downloading the Thanksgiving svg files? I can’t find a link anywhere. We are having a glitch on our site right now that is making all of our links appear in white type face. It is in the process of being fixed as I type this. In the meantime, if you hover in the blank white area between the number of each SVG title and the blog name you can click and it will take you to the blog’s SVG file. I’m so sorry for the inconvenience. I am grateful for my children. They drive me crazy sometimes but after so many years of infertility I know I am truly blessed to have my 2 girls. Expressing gratefulness does increase happiness…focusing on the positive instead of the negative always does.